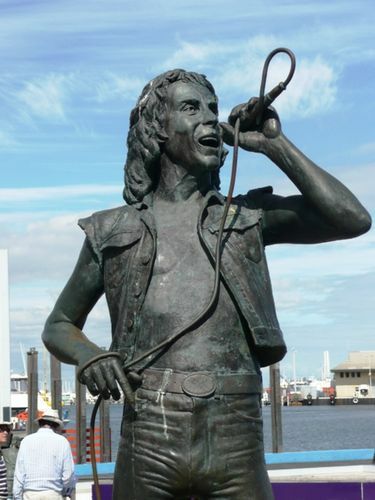 A statue commemorates Bon Scott, the rock singer from band, AC/DC. Bon was born in Scotland in 1946 and moved to Australia with his family aged six, arriving in Melbourne. Shortly afterwards the family moved to Perth. He attended North Fremantle Primary and John Curtin Senior High School and had an interest in music from an early age. He played drums in the Fremantle Pipe Band until he was 17. He then joined the Valentines and moved to Melbourne and when they broke up he joined Fraternity which was later renamed Fang. In 1974 he joined the newly formed AC/DC and the band gained success in the late 1970s, filling a void in the pop-oriented Australian music scene of the time. AC/DC had an unwavering commitment to no-frills hard rock, and Bon was regarded as an excellent ‘all round’ performer. He also lived excessively and in February 1980, Bon died in a car outside a friend’s apartment in London, following a huge drinking session. His body was returned to Perth and his family held a private service at Fremantle Cemetery, after which his ashes were interred at the cemetery and a plaque installed by the family in the Garden of Remembrance. A bench seat with a plaque was installed by the family two years later. Ronald Belford Scott (Bon Scott) "The Greatest Rock n Roll Frontman of all Time" (July 2004 issue of UK music magazine 'Classic Rock' was born on the 9th July 1946 in Kirriemuh, Scotland. The Scott family migrated to Australia in 1952, finally settling in Fremantle in 1956, where Bon attended North Fremantle Primary School and later John Curtin High School . His passion for music intensified during his teenage association with "The Caledonian Scots Pipe Band" of Fremantle who awarded him ' Novice Champion for Drumming' four years running. Ron dreamt of being a 'Rock n Roll Star' and began living his dream with voracious passion. He first performed with 'The Spectors' 1965, 'The Valentines' 1966 -1970 and 'Fraternity' 1970 - 1973 before joining 'AC/DC' in 1974 with whom he proceeded to shake the foundations of Rock n Roll music through his writing and performance of what have become recognised by millions of fans around the world as the greatest Rock n Roll anthems ever written including ' Its a Long Way To The Top', 'TNT', 'High Voltage', 'Jailbreak', 'Let There Be Rock' and ' Highway to Hell'. The magic and untimely death of Bon Scott on the 19th February 1980, in London UK, left us with an enduring musical legacy that continues to inspire the Rock n Roll spirit in successive generations. A ' Rock n Roll ' legend whose star continues to rise.